BOB DYLAN was on 60 Minutes flogging his autobiography, and the show ran an old clip in which Dylan was jesting with a 1960s reporter: Q: How do you see yourself? A: As a song-and-dance man. We may need our show-biz enigmas, but what's wrong with being a song-and-dance man? 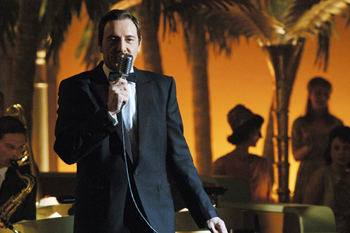 Kevin Spacey's labor of love, Beyond the Sea, is a tribute to Bobby Darin. Darin was never as deep as Dylan or Sinatra, whose styles he picked at, but Darin's music proves that sometimes a belter can get at you when a genius can't. And Darin wasn't ignorant; he had the taste to realize a hit could be made out of Brecht and Weill with "Mack the Knife." Speaking of knives, the way Darin took one to the maudlin ballad "Artificial Flowers" is almost proto-punk. In playing Darin as a restless musician, aware of a potentially fatal heart condition, Spacey makes no special pleading. As a musician and a human being he has his limits. Within these limits, Beyond the Sea is more rousing than a lot of the larger musicals try to be. Spacey makes one particularly unfortunate choice as a director. He has the child Darinhis inner childpop up now and then to guide the performer to memories he has forgotten. There is hardly a place where the device is worth it, even if young Bobby (William Ullrich) shows his dancing skills in the final number. Beyond the Sea coasts over the singer's life. A frail child, he is doted on by his mother (Brenda Blethyn, very flashy and fun). He has a teenybopper hit with "Splish Splash" and goes on to court starlet Sandra Dee (Kate Bosworth). The marriage sours, but they stay together. After seven Top 10 hits, Darin goes out of vogue, then enjoys a Vegas comeback. The courtship scenes are particularly rapturous. Dee and Darin hook up at the Italian location of a farce called Come September. The trick is avoiding Dee's dragonish stage mom (Greta Scacchi); the first stolen date is played as a performance of Darin's best song, "Beyond the Sea," with Spacey in an exuberant yellow-gold suit, shot against the cream-colored stones of a waterside villa. It's like a music video circa 1960, yet it's not a wreck pasted together from MGM musicals, like Kenneth Branagh's Love's Labour's Lost. Cinematographer Eduardo Serra does a superb job riding herd on the rainbow hues of Darin's wardrobe, as well as cooling it down for a gleaming metallic black-tinged finale. John Wilson and Rob Ashford's thrilling arrangements have a brassiness that sounds like live music. And Spacey sings sufficiently like Darin to keep memories of the real thing at bay. His Darin reminds you a little of the aggressiveness and arrogance in Gene Kelly, the chip on the shoulder. What Darin did by approaching "Artificial Flowers" with a kind of sneer is what Spacey has done as an actor for yearscovering up impatience with acid mildness. From toupee to tux, Spacey has Darin's number, and my favorite line is when the singer consoles his upset wife, "No matter what happens, you'll always be Sandra Dee." That truism sums up Beyond the Sea. Being Bobby Darin, like being Sandra Dee (nee Alexandra Zuck), is not the most glittering prize in the world, but it is certainly not nothing. Beyond the Sea (PG-13; 118 min. ), directed by Kevin Spacey, written by Spacey and Lewis Colick, photographed by Eduardo Serra and starring Spacey and Kate Bosworth, plays at selected theaters valleywide.